By 2007, the prevailing view had come to be that inflation no longer mattered because the Fed had everything under control. Not long before that, the mainstream view was that trade deficits no longer mattered. During the dot.com bubble, price earnings ratios no longer mattered. Just prior to the 1970s bear market decade of stagflation, investors believed the business cycle was dead. Before that, oil prices no longer mattered, and before the 1929 crash, financial asset bubbles no longer mattered. The point is, many of today’s investors are facing their first big reality check. As the equity bull market cycle inevitably draws to a close and a new cycle begins, the US Federal reserve is powerless to do anything to reverse it. Excesses built up in the system over the years cannot be washed away with the wave of a magic wand. George Soros’ former investment partner Jim Rogers says the Federal Reserve “does not understand markets or economics. They’re destroying the currency and driving up inflation, which will result in higher interest rates and a worse economy.” Even Alan Greenspan admits that inflation is likely to soar in the coming years. And, as investors face possibly the worst financial crisis the credit markets have ever seen, gold prices continue to rise. Why? Mainly because of an unprecedented increase in global money supply. Money supply has increased by: 42% in Russia, 21% in India,18% in China, 12% in UK and 8% in Canada. Money supply is supposed to increase at the rate of GDP growth, not surpass it by double or more. US money supply (or M3) has been growing at an alarming rate of more than 15% per year, as calculated by economist John Williams, who regularly calculates M3 using Federal Reserve and Treasury Department data. The Federal Reserve stopped publishing M3 in March 2006, a move that which was widely criticized. 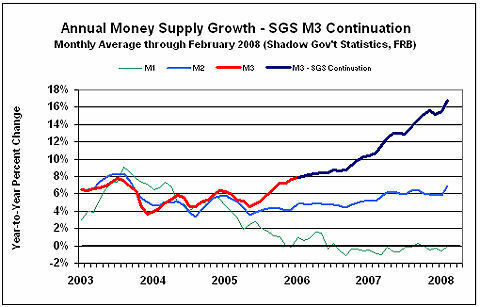 The chart below shows various money supply measurements (M1, M2, & M3) and the reconstructed M3 figure. Why does the US Federal Reserve, formerly under Greenspan and now under Bernanke, consistently cave in to the markets whenever a potential crisis threatens? Because they know millions of individuals in Canada, the United States and the world rely on the markets for their economic well-being. For the past few decades, stock market growth — not savings — has been the key driver fuelling individuals’ savings and retirement nest eggs. The economy has become so deeply intertwined with the stock market that some say the economy now IS the stock market. When the markets shudder, governments and institutions and pension funds and millions of small investors shudder right along with it. Sadly, the central banks’ easy credit policies will create many more bubbles. But right now, they are feeding something far more dangerous than inflation: Our startling complacency about inflation. Since 1990 the U.S. government has adopted a new measure of consumer price inflation that many financial experts agree vastly understates real inflation. John Williams’ chart shows the current (official) CPI versus the CPI the way it was measured before 1990 (pre-Clinton method). 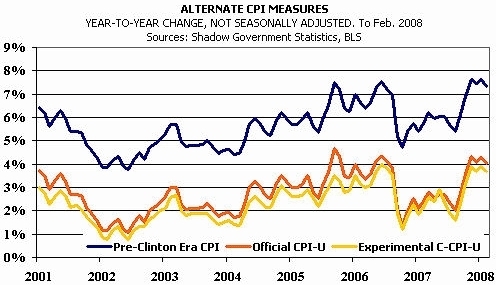 The Experimental method is a new calculation the U.S. government is also measuring the CPI with. For the last several years, I’ve written about investor complacency amidst an almost unprecedented near risk-free 20-year bull market. I’ve written about the growing economic and stock market dangers that are fed in large part by easy credit made available by a consortium of highly accommodative central banks across the globe. And precious metals – gold, silver and platinum – have for decades been an early warning system for smart investors all over the world. Despite the fact that precious metals and all other commodities are currently priced in falling US dollars, since the summer of 2005 gold has climbed by 101% in US dollars, 93% in British pounds, 82% in euros, 93% in Swiss francs, 111% in Japanese yen and 78% in Russian rubles. Canadian dollar price increases have been a more modest 65%, because the Canadian dollar has increased in value from US$0.82 to approximate parity with the US dollar. While gold receives little media attention, its counterparts receive even less. Yet since August 2005 silver prices have shot up by 140% and platinum has increased by 110%. To date, the rise in the price of gold has been largely ignored by mainstream investors and the media, even though precious metals have been one of the best-performing asset classes. It is still a surprise to many that gold has blown past its 1980 peak of $850. This is a clear warning signal to investors as rapid gold price rises are a leading indicator of future inflation. World gold production fell by 1% in 2007, according to the latest Gold Survey from Gold Fields Minerals Service (GFMS). Although gold prices have risen to new highs this year, according to The Economist, fresh supply is being held back by a global shortage of mining professionals and equipment. Wall Street and the mainstream media attribute much of the price increases to jewellery demand from China and India. This is simply not the case. While this is an important demand factor, in South East Asia jewellery is not regarded as just an adornment, as in western countries. It is held as a monetary asset that is used to preserve wealth from generation to generation. In other words, there is another, stronger force at work behind the rise in price of precious metals. Gold and silver have been used as money for over 3,000 years, and platinum for several hundred years. Today, they are still used by the world’s richest families as a store of wealth and an inflation hedge. Although there is considerable controversy over central banks’ leasing of gold, they report current gold holdings of about 928 million ounces, down 160 million ounces from the 1980 peak of 1,080 million ounces. While western central banks have reduced their holdings and may have leased substantial quantities of their bullion holdings, developing countries have been adding to their reserves. Today, a number of central banks have openly discussed diversifying out of US dollars and increasing their gold holdings. The fact that most banks and brokerages trade gold at their currency desks rather than their commodities desks also attests to gold’s monetary role. If we understand gold’s crucial monetary role, what does its rising price indicate? Whether we like it or not, rising gold prices are essentially a vote of decreasing confidence in the future value of paper currencies and monetary policy, and a leading indicator of future inflation. The perma-bulls may keep on saying: “This time it’s different”, but the business cycle always turns, and the stock markets always turn with it..
Mining stocks and precious metals proxies and derivatives may provide some exposure and trading opportunities, but in the current environment, the prime goal must be real wealth preservation. Real wealth preservation requires fully allocated, segregated and insured bullion. The price of gold has been steadily rising in all currencies since the summer of 2005 and is now accelerating. Investors would be prudent to alter their investment portfolio structure to reflect this change. They must brace themselves against the impending storm caused by rising real inflation sideswiping consumers and government that are already stumbling in debt. The most effective way to protect your portfolio from upcoming systemic financial turmoil? An investment in precious metals bullion. Bullion or Mining Stocks. Do You Have the Right Mix?